Yes I know it’s ages till Christmas yet but if I leave all the Christmas recommendations till nearer the time then you won’t have time to decide if you want to read any of them will you? Anyway, it’s not that long, just under 9 weeks now. So I plan to review one Christmas book a week for the next few weeks starting today with Christmas at Lilac Cottage by Holly Martin. I’m sure you’ll agree that the cover is just lovely. The cottage looks so cosy and welcoming under its blanket of snow. I found this story of Penny and Harry a thoroughly warm and entertaining read. Harry and Daisy move into the annexe at Lilac Cottage not long before Christmas and Holly looks forward to making friends with her new neighbours. There is an instant attraction between Penny and Harry, something they both try to resist but, thankfully for the story, they don’t manage to resist for long! Holly Martin has created some lovely characters who you will instantly warm to and you’ll certainly be cheering Penny and Harry on as their friendship quickly develops into a strong relationship with not a few steamy moments despite the cold outside! Daisy is a great character too – feisty and loving but with a vulnerable side too. I was really interested in Penny’s ice-carving career. I don’t think I’ve ever read a book where that features and it was quite fascinating. The setting of White Cliff Bay is just brilliant – can I move there please? I love the idea of a community where everyone learns sign language so they can communicate with a hearing-impaired child. A community which has a telephone tree so that important messages can quickly be passed around. A community that pulls together when their annual Christmas ball is threatened by heavy snow, and within a few hours has dug out roads and produced food, wine and entertainment to ensure it goes ahead. Mind you, it’s also a community where everyone knows everyone else’s business and I’m not sure I’d like that aspect of it! Holly Martin has an entertaining, gentle style of story telling that will make you want to keep reading. There were lots of scenes when I genuinely laughed out loud – all I’m saying is food fight! And there are lots of scenes that will make you smile, as well as a few dramatic moments. There is plenty romance in the story with Henry’s speech about love near the end giving me such a warm feeling inside. “When you love someone, you love everything about them…. You love them through the good times and bad times… You love them because they make you laugh and cry”. Isn’t that just perfect? Holly Martin has written a second book in this series, Snowflakes on Silver Cove, and I’m certainly looking forward to reading more about the residents of White Cliff Bay. My thanks to publishers Bookouture for providing a review copy via Netgalley. 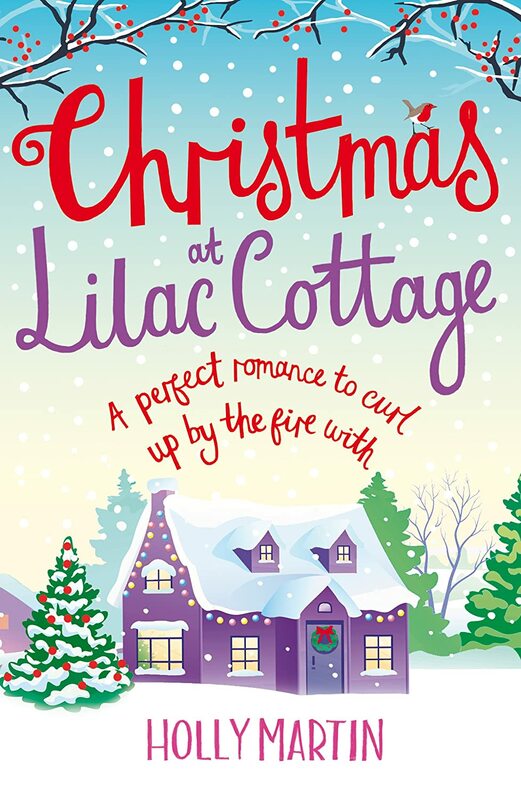 Christmas at Lilac Cottage was published on 25th September and you can order a copy here: Christmas at Lilac Cottage. It’s currently only £1.99 – a Christmas bargain I’d say! Penny Meadows loves her home – a cosy cottage decorated with pretty twinkling fairy lights and stunning views over the town of White Cliff Bay. She also loves her job as an ice-carver, creating breathtaking sculptures. Yet her personal life seems frozen. When Henry and daughter Daisy arrive at the cottage to rent the annex, Penny is determined to make them feel welcome. But while Daisy is friendly, Henry seems guarded. As Penny gets to know Henry, she realises there is more to him than meets the eye. And the connection between them is too strong to ignore. While the spirit of the season sprinkles its magic over the seaside town and preparations for the ice sculpting competition and Christmas eve ball are in full swing, can Penny melt the ice and allow love in her heart? And will this finally be the perfect Christmas she’s been dreaming of?